Sunday, 6 November, saw thousands of spectators crowd the banks of the Pearls International Speedway, St Andrew, for the final Grenada Motor Club (GMC) International Drag Racing event of 2016. They were in for a treat as the track opened promptly at 2 pm to allow racers to test and tune their vehicles, ready for competition at 4:30 pm. This was preceded by an exhibition drive around the track by all 32 participating competitors, readying both the crowd and the racers for an action packed afternoon. 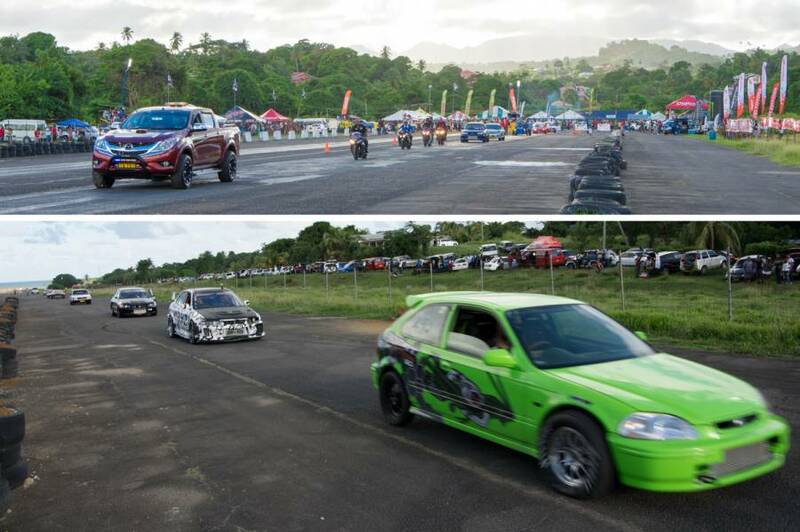 “All cars were welcomed, street and custom built, once they were able to meet the stipulated safety requirements, which they are all checked for before we accept them into the competition”, stated Ian DaBreo, PRO for the Grenada Motor Club. “Ranging from times brackets of 16 to 7 seconds to cover the quarter-mile track, each racer is looking to achieve the top position within his bracket, by cutting even a fraction of a second off his last registered time. The fastest car at this event, a Rail driven by Mervin Bonner of Trinidad & Tobago, covered the track distance in just 8.87 seconds!” he continued. 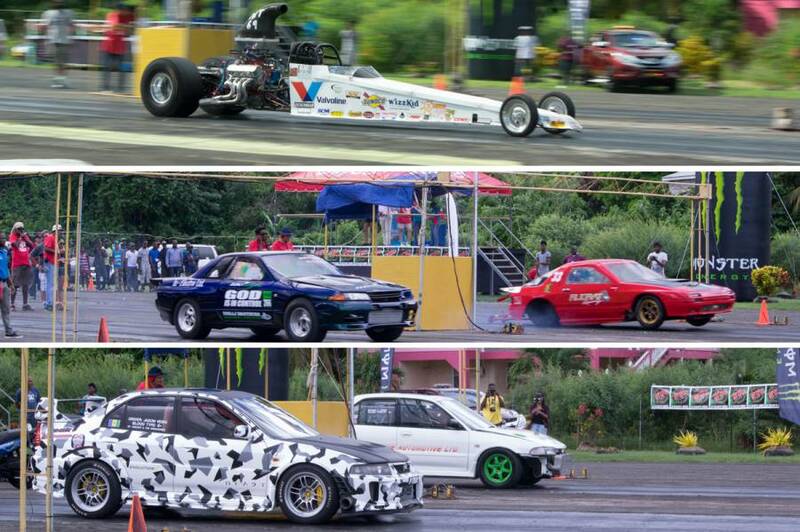 “One of the significant achievements of motorsports here in Grenada is that it attracts a large local audience. We saw several thousands of persons on Sunday, the main competition day, alongside an increasing number of Grenadian race enthusiasts. In addition to this, an ever-increasing number of regional participants, who came with their families and race teams for the event, often stay longer to enjoy our island. As Grenada continues to grow as a tourism destination, sports tourism can make a significant contribution”, said Angus DaBreo, President of GMC. The GMC continues to work to improve the calibre of the event and also continues to make a strong stand, regarding safety within and surrounding the event, and has adopted the slogan; ‘Drive on the Road, Race on the Track’, for its events. Messrs DaBreo gratefully acknowledged the support of the increasing number of sponsors who helped to make the event a success: Title Sponsor Stag; Steele’s Auto Supplies; Monster Energy Drink; Digicel; McIntyre Bros Ltd; Waggy T Rental & Sound Co; MTV; Prickly Bay Marina; St Augustine’s Medical Services; AllyDay Creative Projects; Swiftpac Grenada; Chopstix Restaurant; NG Electrical & others. The first GMC International Drags event for 2017 is tentatively scheduled for 7 to 9 April. The final Test & Tune event for local racers will be held in December of 2016, to allow for the compilation of their total annual competition points.